Torquato Jardim, who will oversee the investigators and other members of the federal police department, in the past has criticized the Car Wash corruption probe that has now spread to include alleged bribes by a construction company of politicians around Latin America. Jardim was appointed to the post on Sunday by Temer, who himself is under investigation for alleged obstruction of justice and corruption. The unpopular president has seen his support in Congress shrink amid growing pressures for him to step down. He denies any wrongdoing and has said he won't resign. 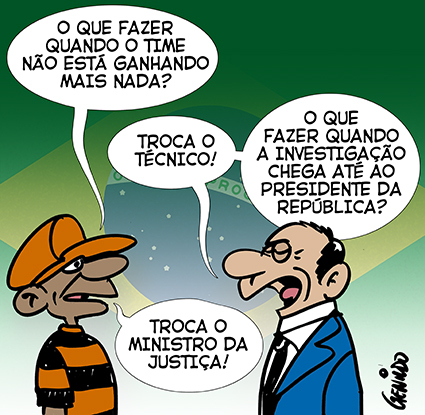 Jardim is Brazil's third justice minister in about a year. He has criticized federal police investigations, raids and strategies in the recent past. He replaced Osmar Serraglio, who was also criticized in the past by the police investigators union. There were reports Serraglio would take over Jardim's previous position as transparency minister, but Temer had not confirmed that. Employees in several offices of the Transparency Ministry put up signs and banners protesting Serraglio getting that post. Serraglio had been under pressure to resign as justice minister after he was linked to a corruption investigation in the meat business, but he stayed on the job until Temer decided to bring Jardim in. The president did not explain why he made the change. Until a few years ago, Jardim was a member of Brazil's top electoral court, which on June 6 will launch a trial that could remove Temer from office on charges of illegal campaign financing as well as strip impeached former President Dilma Rousseff of her right to run for office for up to eight years. Tags: Brazil, Michel Temer, Torquato Jardim. é, a m*rda é a mesma, só mudam as moscas..